NEW LIFE ON THE FARM: A New Month Is Closing In On Us! A New Month Is Closing In On Us! June is nice usually warm and full of sunshine. And it brings us more of these to delight our senses. The come lately seedlings in the green house is Banana Melon. The seeds were shared last fall from one of the fiber ladies and I had all but forgotten them until I rummaged through my stash of assorted goodies. Now a week later all but two of the compartments have nice healthy seedlings worshiping the sun. Two containers of cat grass not yet sprouted. It will be fun to see what the five cats who live here think about the offerings when they reach cat meet grass levels. June brings several birthdays in our family. My sweet daughter Annie and my first born granddaughter Aubrey share a birthday three days apart. I will out of respect for Annie not count out the difference in years. But Miss Brey will be 20. No not days, not weeks, not months but years. How did *that* happen. It seems as yesterday when the phone rang at one in the AM and the other end of the line was my son now a proud Papa with a daughter in the background wailing like a Cantor. Brey in red and Em in purple at about 3 years. 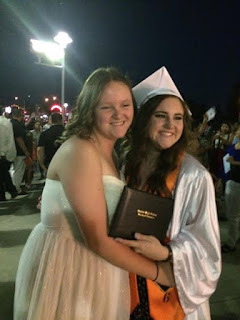 The birthday girl graduating a few years back and her cousin who will be celebrating the big 20 in a few more months. Look at that from kids to young women with bright futures in the click of a mouse! In our county of residence June is also fair month. In Fresno county October was fair month so it seems a bit odd even with six years of living in Shasta county. So the months leading up to June are consumed with weaving and spinning to have a go at some fun competition with the other local fiber folks. Yarrow update which pretty much speaks for itself. Up to her eyeballs in kibble feeling much better and eating with her old gusto. Yarrow has only three days left of her course of treatment and is pretty much acting as if nothing ever happened. Take heart Susan your "sister" in treatment (except the sun isn't an issue with her) is as good as before as you will be too I expect. For me now back to the fair entry prep. As we march through this last day of May and roll into June have a wonderful weeks end to celebrate all that the warmer weather brings. Yarrow, my sistah! :) I took my last med today and hoorah! Of course, the entire weekend looks gloomy. Go figure. I love the two photographs of the girls! They are adorable and beautiful, in that order. I'm just hoping this new month of June goes much, much more slowly than May did! Good golly, things are hoppin' around here and the days are never long enough. Especially to keep up with always interesting blogs like yours!